The holidays are here and many people are dreaming of a white Christmas. The likelihood of seeing those dreams come true, however, are largely dependent on where you live. According to NOAA, a white Christmas is defined as having at least one inch of snow on the ground on December 25th. 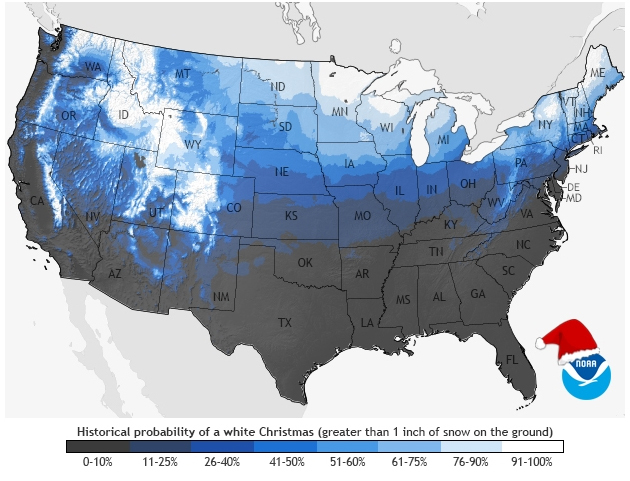 In the US, the climatological probability of having snow for Christmas is greatest across the northern tier of the country. Moving south, average temperatures increase and the chance of snow steadily decreases. Here in New York City, the odds of having snow on Christmas Day are, on average, less than twenty-five percent. This low probability is largely due to the city’s proximity to the Atlantic Ocean and its moderating influence. This year, despite some significant snowfall earlier in the month and the possibility of a light snow shower tonight, NYC is not expecting a white Christmas. Snow or no snow, the Weather Gamut wishes you a very Happy Holiday! This entry was posted in weather and tagged cold, holiday, national, nyc, snow, winter by Melissa Fleming. Bookmark the permalink.